This article was written By John Berra on 24 May 2015, and is filed under Features. 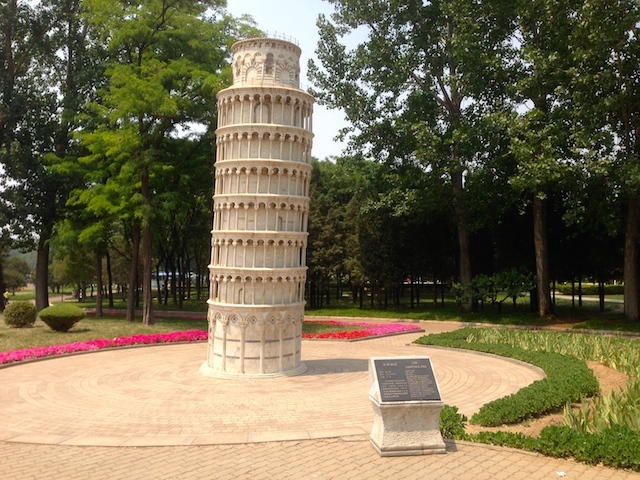 Since opening to the public in 1993, Beijing World Park has attracted visitors with its promise of traveling around the globe in a single day, or mere hours if you traverse its artificial landscape of international landmarks without stopping to take any photographs. Sights at the park include the Empire State Building, the Eiffel Tower, Notre Dame Cathedral, the Leaning Tower of Pisa, London’s Tower Bridge, and the Sydney Opera House, all of which are scaled-down replicas that serve to represent their respective countries. 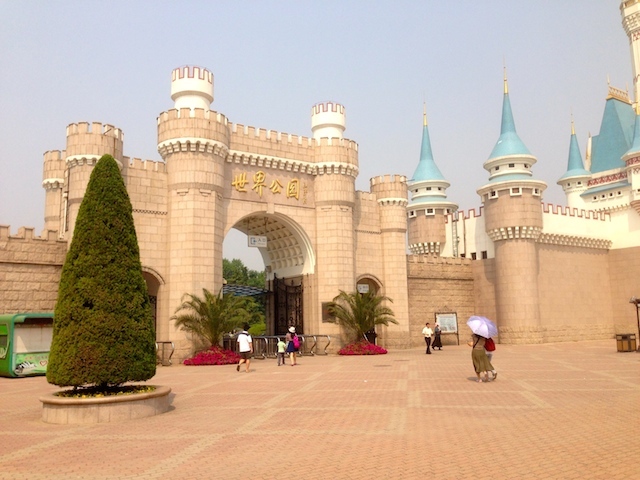 As an example of China’s initial domestic leisure market boom, Beijing World Park has proved to be an enduring attraction whereas similar amusement attractions have been left incomplete (Wonderland Amusement Park) or suffered negative press for copyright infringement (the Walt Disney Company was furious when the use of its characters at Beijing Shijingshan Amusement Park came to its attention). Beijing World Park, however, has become best known internationally as the setting of The World (2004), a globalization commentary by the Sixth Generation figurehead Jia Zhangke which was filmed at a time when an estimated 1.5 million visitors were walking through the park’s European-style entrance each year. It was Jia’s first feature to be officially approved by China’s notoriously restrictive Film Bureau, although the director had no intention of portraying the park as a pleasurable leisure space, instead playing up the sheer absurdity of its fabricated entertainment landscape through quasi-documentary aesthetics to deliver a satirical indictment of the cultural erosion caused by China’s commercialization. If Jia’s abstraction of Beijing World Park and the unabashed escapist paradise promised by its publicity materials exist at opposing ends of the critical spectrum, then my May 2015 visit fell comfortably in between. As recent years have seen household income in China increase in tandem with the touristic desires of the nation’s white collar citizens, more upwardly mobile singletons and families are able to travel overseas for vacations, thereby making Beijing World Park as something of a relic. The bustle of The World was nowhere to be seen with a modest level of visitors that could be compared to that of a quiet public park on an average early summer afternoon. I started to think about Wade Shepard’s fascinating urbanisation study Ghost Cities of China (Zed Books, 2015) which clearly charts the development of China’s new metropolises as they go through the extended ‘ghost city’ stage of being sparsely populated before becoming fully-fledged urban sprawls. Shepard provides insightful case studies of suburban developments that were modelled on European towns – Shanghai’s German Town and New Netherlands Town, the replica of Hallstatt in Guangdong province – often noting how such places are inherently fake yet perfectly agreeable to stroll around as they provide a sense of the European way of life through studied imitation. You can see the creative roots of such urbanization initiatives – and their subsequent bouts of social-economic inertia – in the miniature replicas of Beijing World Park, which have a certain charm at first glance, but ultimately inspire little wonder. 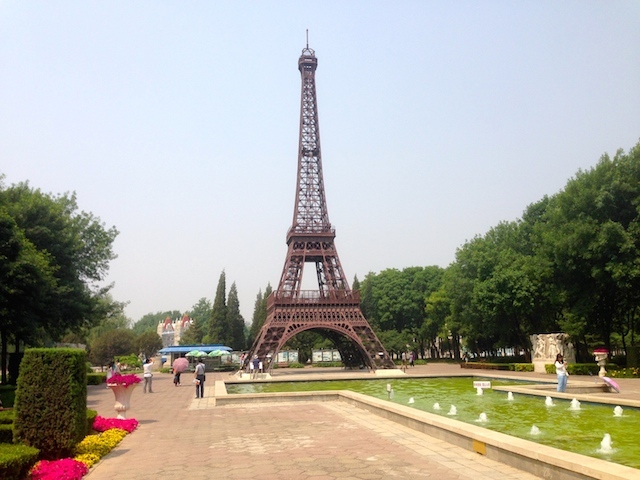 The park’s Paris section even prompts thoughts of Tianducheng, an under-populated town in Zhejiang Province that has utilized the architectural style of the French capital as the basis for an exclusive Hangzhou suburb and boasts a replica of the Eifel Tower. It’s not entirely appropriate to draw a direct correlation between China’s imitation ‘ghost cities’ and this fading theme park. As Shepard convincingly argues throughout his book, such European-style urban developments still have the potential to become something, while Beijing World Park is in a gradual process of decline. It seems to be well maintained and a rollercoaster ride remains in operation at the Grand Canyon, but the lavish stage shows that featured in Jia’s film – the director’s muse Zhao Tao plays a member of the dance troupe – seem to have fallen victim to cutbacks, while I did not witness any of a spectacular processions promised by the online publicity materials. Jia’s use of the park served his critique of China’s rapid rise to superpower status: taking the park as a social-economic microcosm, he illustrated how it was hugely successful as a leisure enterprise, thereby bringing riches to its unseen backers, while the migrant employees received basic wages and lived in cramped dormitories, essentially trapped in a post-cultural landscape. 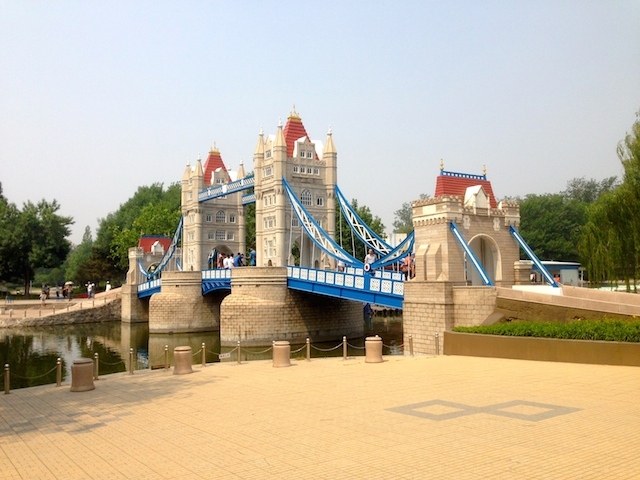 After a few hours at Beijing World Park, its fakery does become a bit overwhelming – especially if one further condenses its miniature take on the globe by speeding around in an electric car. Still, there is little sense of the dehumanisation that Jia evoked in The World, which may be one of the employee benefits of the park’s decline as less visitors, less show times, and less blaring announcements makes for a much easier shift. Indeed, rather than being subjected to the oppressively crass environment of Jia’s fact-fiction hybrid, I instead had a rather serene, if still occasionally surreal, leisure experience. If the filmmaker were to reprise his grand metaphor, he would be best advised to take his digital cameras to the more popular Happy Valley Beijing, which has outpaced Beijing World Park by offering visitors forty rides, an IMAX theater with seven screens and an adjacent shopping complex, although it follows its predecessor’s lead by using global or historical themes as backdrops for its various areas. The present day state of Beijing World Park – and its oddly enduring appeal – can be seen in the closing scenes of Róbert Ingi Douglas’ comedy This is Sanlitun (2013) in which ex-pat Gary (Carlos Ottery) takes his young son Johnnie (Daniel Douglas-Li) to see its miniature monuments with best friend Frank (Christopher Loton) along for company. An absent father straining for reconnection, Gary has previously tried to bond with Johnnie by taking him to the Great Wall, an activity fraught with frustration as it involves a lengthy taxi ride, the unexpected presence of potential girlfriend Momo (Hu Gaoxiang), and a moment of panic when Gary loses sight of his son while arguing with his unsuitable love interest. 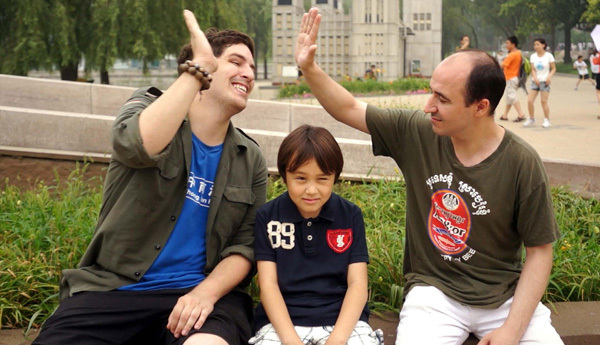 By contrast, Beijing World Park provides a safe, confined space, where father-son relations can be strengthened without the mishaps that can occur when embarking on more ambitious family outings. As with all entertainment spaces that have remain in operation long after their popularity has peaked, Beijing World Park is a touristic curiosity that provides a reminder of the recent past which, in this case, is a time when the global mobility that is now part of the Chinese reality was merely part of the nascent Chinese dream. Yet the need to get away from it all when living in a city of almost 22 million people has led it to be partially reinvented by less affluent citizens as a place to take it easy from a present that spends too much time speculating about the future.